In the Blending Options area of the Layer Style dialog box and the upper-right corner of the Layers palette, you see a pair of adjustments named Opacity and Fill, as shown in Figure 12-19. Both have an impact on the visibility of the content of your layer. Figure 12-19: The Opacity and Fill sliders control visibility of a layer. 1. Add some text to an image. This is a wonderful trick for adding your copyright information to sample images because everyone can see the image, but no one can use it without your permission. Start by adding your copyright information or perhaps the word Sample. 2. Apply a layer style to the type layer. A bevel, a thin black stroke, and perhaps an inner shadow make an excellent combination. 3. Reduce the Fill slider to 0%. You can click and type in the Fill field, click the arrow to the right of the field and drag the slider, or simply click the word Fill and drag to the left. The type layer disappears, but the layer effect remains. You can see all three steps in Figure 12-20. The Blending Options pane of the Layer Style dialog box offers you a number of other choices in the Advanced Blending area, as shown in Figure 12-21. I Channels: Clear one or more of the color check boxes in the Advanced Blending area to hide the layer's content in that color channel. Clear the R check box, for example, and you hide the target layer in the Red channel. 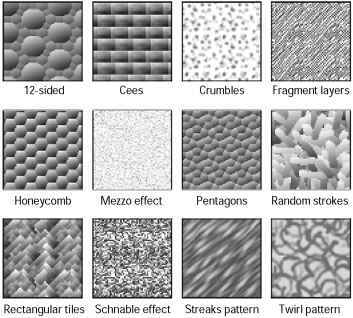 Figure 12-20: Add a type layer, apply a layer style, and then reduce the Fill setting to 0%. Figure 12-21: You find Advanced Blending options in Blending Options of the Layer Style dialog box. ii Knockout: You can use the content on the target layer to create transparency on lower layers. The top layer becomes transparent as do the layers below every place that the upper layer had visible pixels. (I think of it as a "cookie cutter" effect.) If you want to restrict the effect, use the Shallow option, and the knockout extends only to the lowest layer in your layer group. The Deep option knocks out to the Background layer (or to transparency if your image doesn't have a background layer). i Blend Interior Effects as Group: You can blend the Inner Glow, Satin, and your overlay effects before the layer as a whole is blended with lower layers. Use this option if it seems your layer effect's blending mode is being canceled out by the layer's own blending mode. i Blend Clipped Layers as Group: If you have layers clipped together (see Chapter 10), you can elect to use the base layer's blending mode for all the layers or let each layer interact independently. You generally want to leave this check box marked. i Transparency Shapes Layer: Another option that you'll almost always want active, Transparency Shapes Layer restricts the layer style to the visible pixels on the target layer. If, for example, you're working with a small rounded rectangle and a Color Overlay layer effect, clearing the check box fills the entire layer — not just the rounded rectangle — with color. i Layer Mask Hides Effects: If the target layer's visibility is controlled with a layer mask (see Chapter 8), you can opt to have the layer style hidden by the mask, too. You can also use a layer mask to hide just the layer style with this option — say, for example, when you need to make sure that your drop shadow doesn't fall where it shouldn't. Simply create a layer mask that hides those areas where you don't want the style visible and mark the Layer Mask Hides Effects check box. If you've got an image with a plain white (or plain black) background, you can make that background disappear with the Blend If sliders (see Figure 12-22). In the Layers palette, double-click the layer name Background and rename the layer. At the bottom of the Layers palette, click the second button from the right to add a new layer. Move the new layer below the original layer. 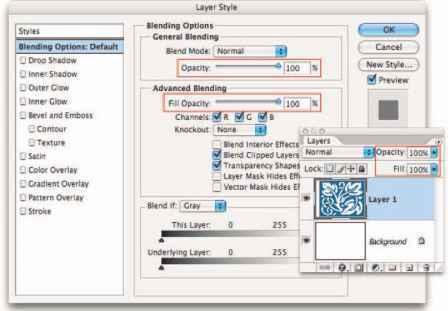 With the original layer active, open the Blending Options pane of the Layer Style dialog box and drag the upper-right Blend If slider control to the left until the background disappears. As the white background disappears, the checkerboard transparency grid becomes visible. Press (Mac)/Ctrl+E (Windows) to merge the layers and retain the now-transparent background. Figure 12-22: Make a white background disappear with the Blend If sliders.